Saves and characters can be imported from Champions of Krynn (see Import saves and characters). Bundled with Champions of Krynn and The Dark Queen of Krynn. Saves and characters can be imported from Champions of Krynn. Ensure the save files are in the expected location. For GOG.com, copy the contents of the Champions of Krynn SAVE folder into the Death Knights of Krynn SAVE_CH folder. For retail, ensure that the fifth line in DKK.CFG reflects the location of the Champions of Krynn SAVE folder. 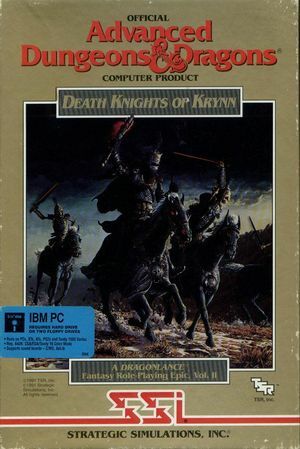 Run Death Knights of Krynn and choose Load Saved Game (recommended) or Add Character to Party. Choose the save slot or character to use (for characters repeat as needed to add each one). The default save folder can be changed by editing DKK.CFG.